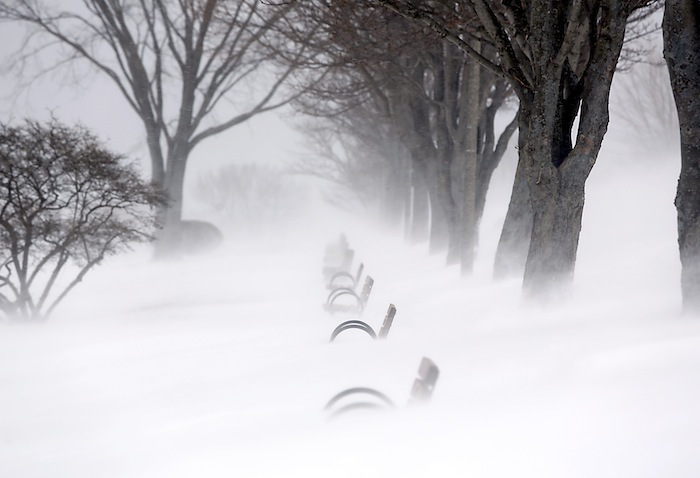 Historic amounts of snow combine with powerful wind gusts, creating monstrous drifts that complicate cleanup. 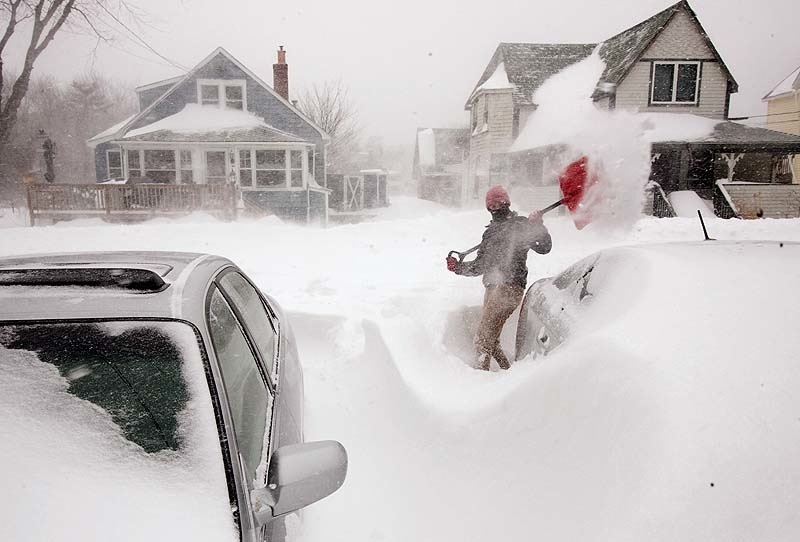 Maine got buried under record snowfalls and deep snowdrifts Saturday as a historic blizzard stalled travel, sent vehicles sliding off roads and knocked out electricity to thousands. 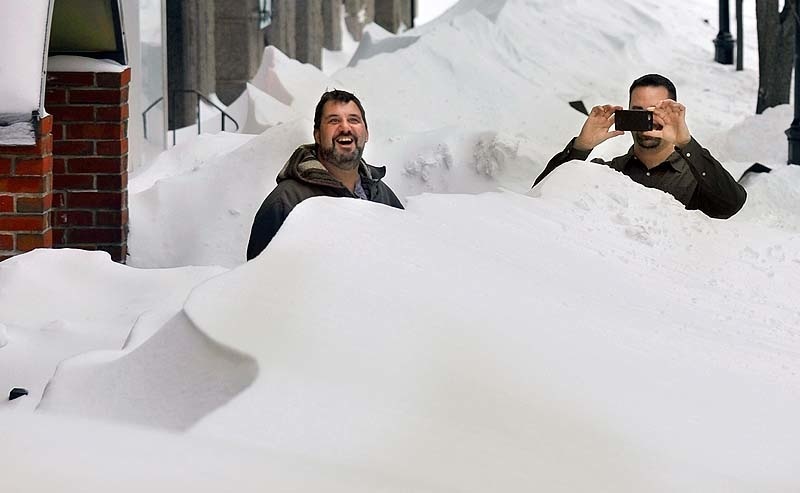 Between 2 and 3 feet of snow fell on most of southern and central Maine from Friday through Saturday afternoon, when the massive nor’easter finally moved off to the east, the snow ended and fierce winds began to ease. 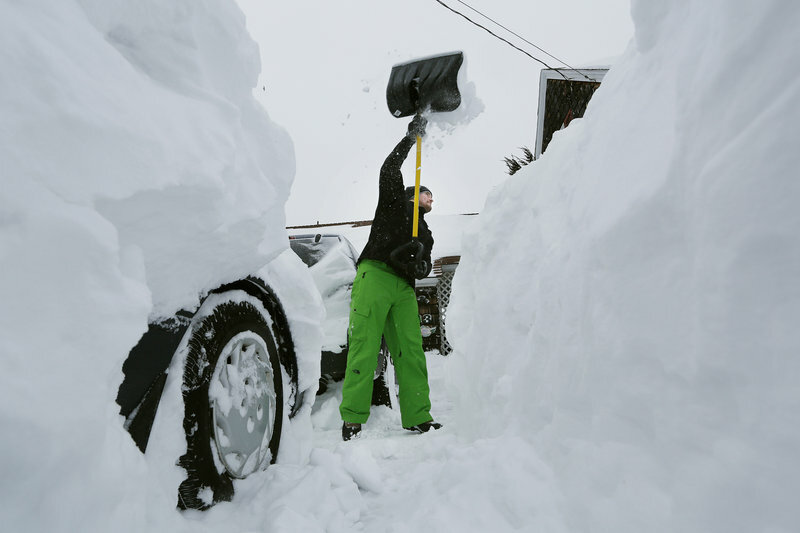 A total of 31.9 inches of snow fell at the Portland International Jetport, smashing the previous single-storm record of 27.1 inches from January 1979. 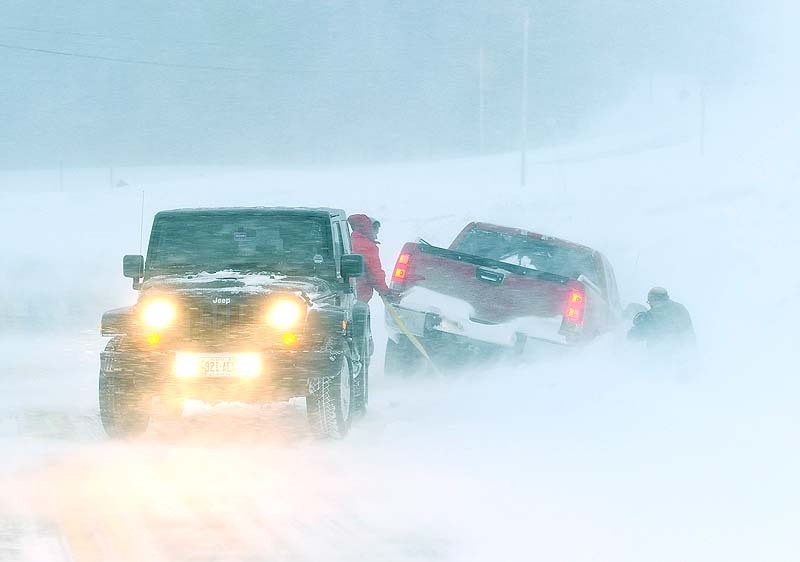 The heaviest snowfall reported in the state Saturday was 35.5 inches in Gorham. Other totals included 32 inches in South Berwick, 30 inches in Westbrook, 27 inches in Saco, 24.5 inches in Hollis, 24 inches in Otisfield, 26.5 inches in Richmond and 25.5 inches in Lewiston. Sunshine and temperatures in the high 20s to low 30s were expected Sunday, when the long, slow cleanup will continue in places such as downtown Portland. The combination of a historic snowfall, powerful winds and the storm’s duration of nearly 36 hours made it especially hard to deal with. The strongest wind recorded in Maine during the storm was at Matinicus, where a gust of 77 mph was recorded at 2 a.m. Saturday. 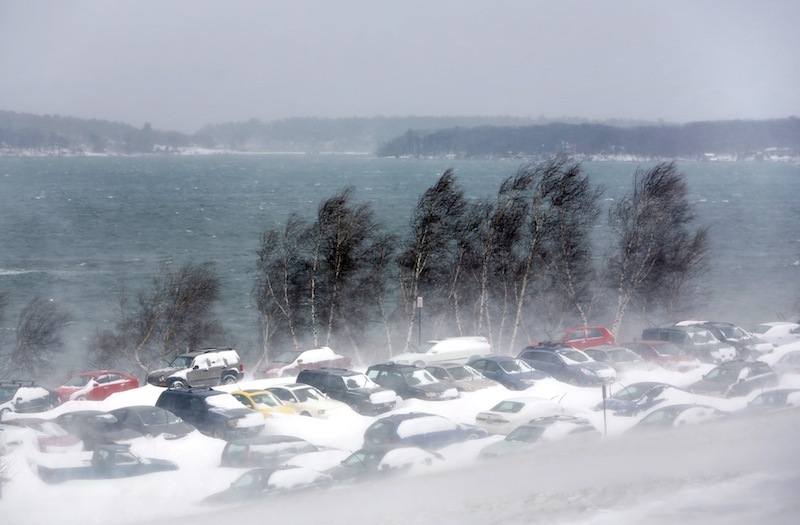 Gusts of more than 50 mph were measured in Portland and Augusta on Saturday morning and most towns and cities in southern Maine recorded gusts of at least 40 mph. 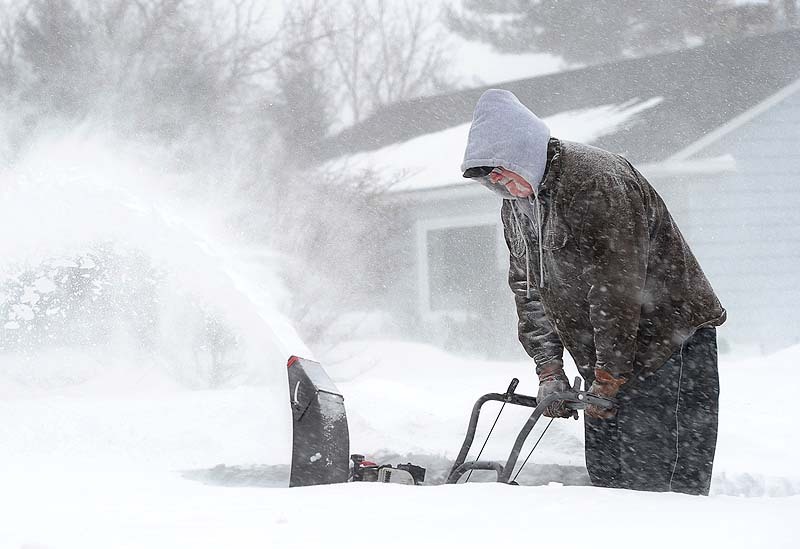 In many areas, drifting snow buried cars Saturday and piled up against houses. Merely opening a door to get outside was difficult. 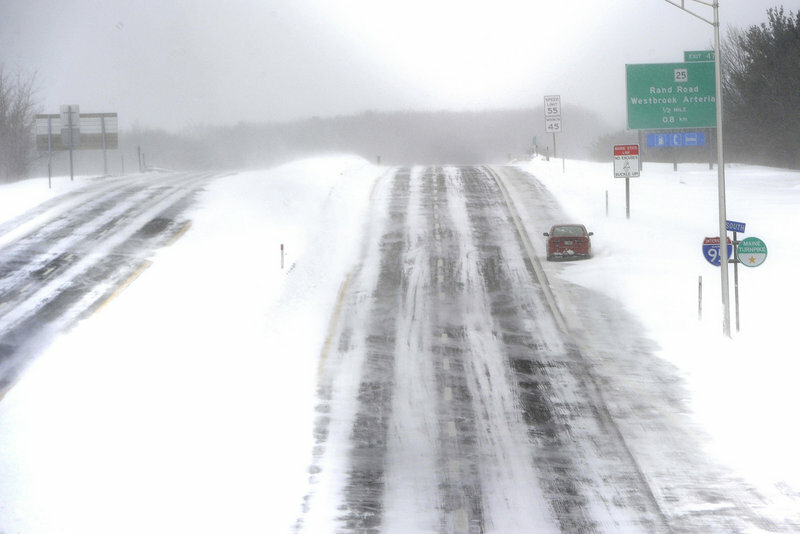 Transportation officials warned Mainers to stay off the roads Saturday because of blowing snow that created slick conditions and reduced visibility. Dan Morin, spokesman for the Maine Turnpike Authority, rode with veteran plow truck drivers Friday night as the winds pushed snowdrifts back across the freshly plowed pavement. Police departments around the state reported numerous minor accidents and vehicles sliding off roads or getting stuck in snowbanks, particularly Friday night. “Our resources are stretched responding to slide-offs and incidents. We may not be able to get to certain incidents,” Morin said early Saturday. In Westbrook, dispatcher Brad Scovil said plow trucks had to accompany police cruisers overnight as they responded to emergency calls in case the police vehicles became stuck. 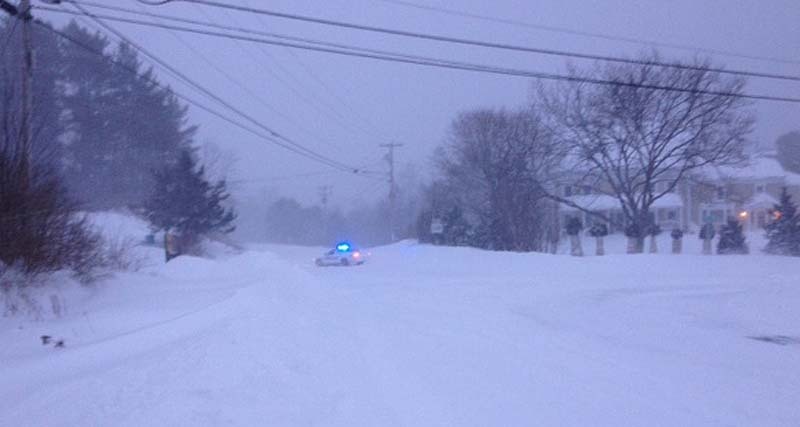 In Scarborough, police temporarily closed a section of Running Hill Road because of snow drifts and white-out conditions. 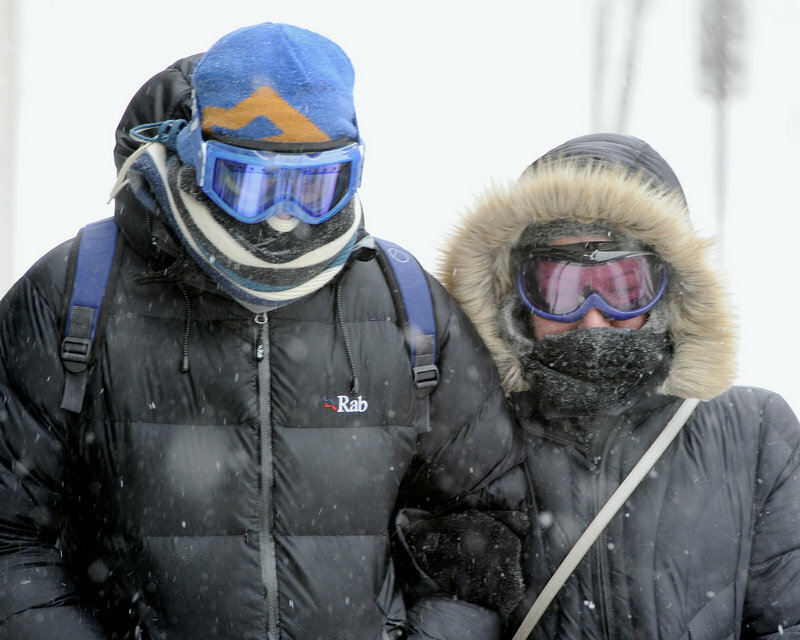 Motorists appeared to heed the advice to stay off the roads Saturday afternoon, which prevented more accidents and more injuries, according to emergency officials. No major crashes were reported in southern Maine after a 19-car pileup in Cumberland early Friday. 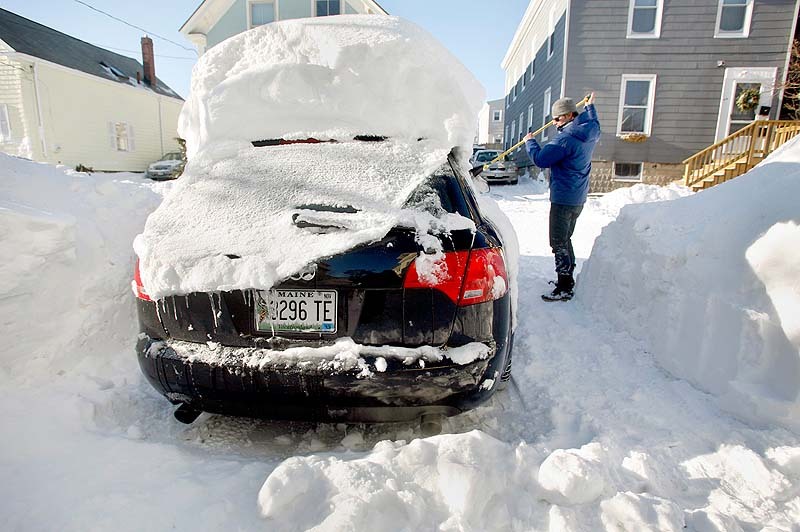 Mainers who stayed off the roads also did not go far using mass transportation Saturday. All Saturday morning flights in and out of the Portland International Jetport were canceled. The first flight to arrive since mid-day Friday was a United Airways flight from Chicago and that landed shortly before 7 p.m. Saturday, about two hours behind schedule. A handful of other flights were expected to arrive later Saturday night and the airport’s arrival and depature board was beginning to carry information other than a list of canceled flights. The Amtrak Downeaster canceled all trips between Portland and Boston on Saturday and said service will resume Sunday at 7:05 a.m. with a southbound train leaving Brunswick. Casco Bay Lines resumed Peaks Island service late Saturday morning after suspending earlier trips because of high winds. 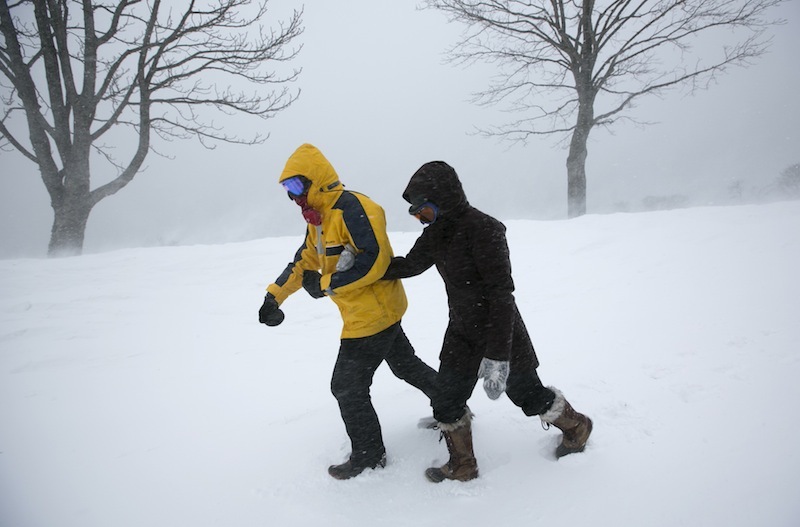 The first run to Peaks Island left at 10:45 a.m. Service to outer islands began in the afternoon. Bus service was canceled for the day in Portland and South Portland. 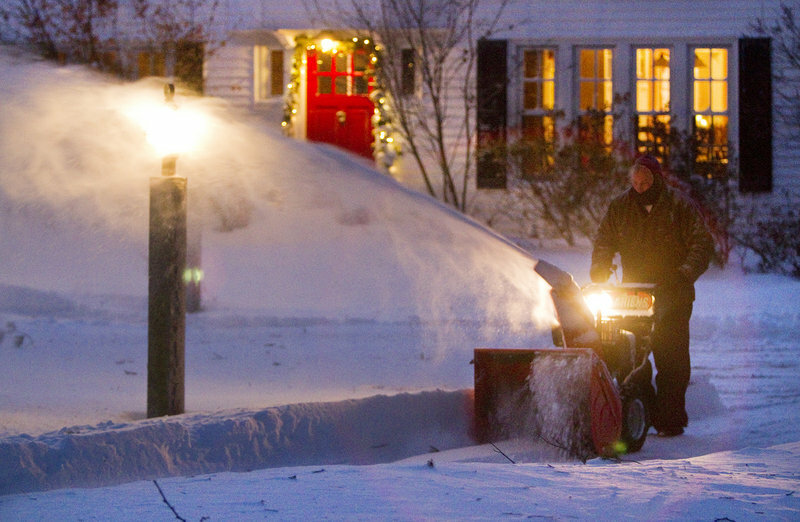 The light, drifting snow was a bear for plow drivers, but it minimized power outages in Maine. In all, 18,420 Central Maine Power Co. customers lost electrical service at some point during the two-day storm. The peak was Saturday morning, when 11,467 customers were without power, said John Carroll, CMP spokesman. The powerful winds and snowfall slowed repair crews during the height of the storm Saturday morning. In some cases, the company had to cut off power to ensure safety and wait until conditions eased to allow crews to make the repairs. By 5 p.m., however, CMP had restored power to all but 320 customers and the company said it expected to have everyone online by late Saturday. Carroll said that Maine was spared major outages seen in southern New England because the snow was light and dry and blew off, rather than sticking to tree limbs. “As long as it doesn’t stick to trees we don’t have problems,” Carroll said. He said the fact that the ground is frozen also helped by keeping trees upright. He also credited advance preparation by CMP crews and a limb- and tree-cutting program along power lines for the lack of outages. Emergency management officials in York County kept a close eye on local beaches as high tide crested at 9:54 a.m. But while forecasters predicted that a storm surge of 1 to 2 feet would bring water over dunes and sea walls, actual flooding was not as bad as feared. Biddeford and Kennebunk closed coastal roads as water splashed over beaches and parking lots, but no structural damage was reported, said Dave Francoeur, interim director of the York County Emergency Management Agency. The playground at Mother’s Beach in Kennebunk flooded and water covered parking lots at York Beach. Saco’s Camp Ellis, where flooding is common during major storms, escaped without major damage, Francoeur said. Clogged vents from drifting snow caused carbon-monoxide problems and triggered warnings to keep heating vents clear. In Biddeford, five people were treated at Southern Maine Medical Center for possible carbon-monoxide poisoning Saturday afternoon after the outside vents to a propane furnace were clogged with snow. The injuries were not life- threatening. In Augusta, snow apparently blocked a roof vent pipe at the Turnpike Mall, causing a dangerous buildup of the gas. Firefighters ventilated the bulding and no injuries were reported. The Maine Mall closed Saturday and the storm also led the U.S. Postal Service to cancel mail delivery and close post offices. And, it delayed the delivery of the Portland Press Herald to some subscribers Saturday. About 40 to 50 percent of the newspaper subscribers received their newspapers Saturday, said Michael Ivancic, vice president of operations and circulation for the Press Herald and Maine Sunday Telegram. Papers that couldn’t be delivered because of the conditions Saturday were to be delivered Sunday, he said. Meanwhile, the light fluffy snow came as a gift for snowmobilers and skiers. 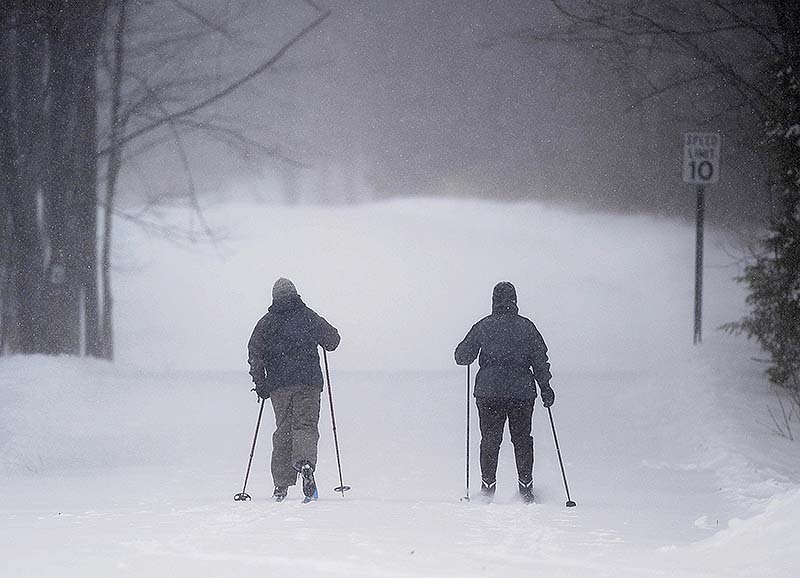 Cross-country skiers who normally have to drive to a trail Saturday cut trails down quiet main streets, including Congress Street in Portland. A snowmobile buzzed down otherwise deserted roads in Buxton. Five members of Yarmouth High School’s ski team — Lydia Sullivan, Ihila Lesnikova, Caitlin Teare, Ellie Teare and Katrine Laukli — skied through the village Friday night and Saturday, taking advantage of conditions for some training and fun. “It reminded me how much I love skiing,’ said Ellie Teare, 15. “We ruled the town,” said her twin sister, Caitlin. Skiers at Sunday River woke up Saturday morning to 16 inches of snow that fell since Friday morning. Darcy Morse, spokeswoman for the ski resort, said Sunday River’s hotel, condos and inns were full this weekend. 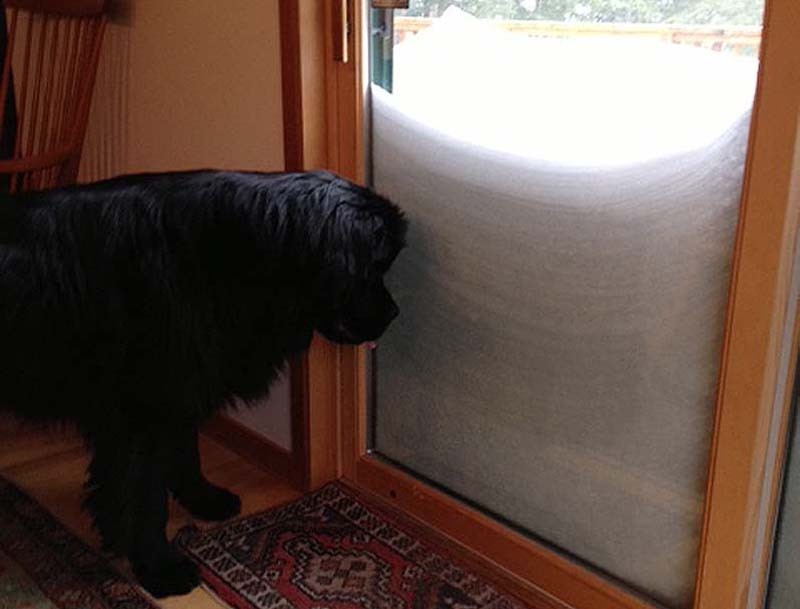 Sugarloaf in Carrabassett Valley recorded more than 10 inches of snow by early Saturday, said communications manager Ethan Austin. The ski area was busy, he said, although some skiers from coastal New England likely stayed home to deal with the record snowfall. Staff writers Gillian Graham, Scott Dolan, Beth Quimby and Ed Murphy contributed to this report.